Joining more than 800 estates from north to south, 80+ Tuscan wineries will open their cellars to the public over the coming weekend. Visitors can not only sample different varieties and buy directly, but many venues also offer tours of the cellars and forays into the fields to learn about cultivation and discover secrets of wine making. For complete information, visit www.movimentoturismovino.it. Guests can enjoy the quintessential Tuscan landscape with its castles and medieval villages, step into churches to view art masterpieces and visit lesser-known family operated cantinas. 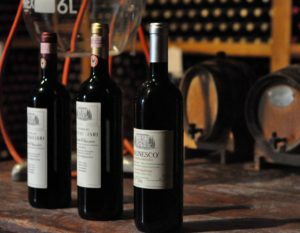 The organizer (il Movimento Turismo del Vino) suggests itineraries such as the Chianti Classico region, which begins in Greve, and moves on to Panzano, then Volpaia, Radda and Gaiole. Key to the quality of the wine making process is the environment of the vineyards, known as the “terroir,” which is revealed by a site visit. Not having an English equivalent, terroir refers to the climate; the altitude; the quality of the soil (the vine needs to draw certain nutrients); the amount of sunshine and rain; and drainage. Using the exact same methods to cultivate grapes won’t necessarily produce the same aromas and flavors when in different locations. Don’t hesitate to expand your horizons and visit the vineyards in the Arezzo area. The charming winery Il Borro (San Giustino Valdarno) will please and surprise palates with its elegant wines. Purchased by Ferruccio Ferragamo in 1993, who instilled his passion in creating intriguing wines, Borro Castle dates back to the 13th century. Increasing experience with practice, sampling the wines with the eyes, nose and mouth grants the ability to evaluate depth. Age will influence the character of the wine; most important is the capability of assessing lingering sensations. Each person will have different flavor impressions and will enjoy finding a wine where the combination of the tastes, aromas and texture create harmony and balance. This year, the International School of Comics, Florence’s well-known center for cartoon artists, sponsors a bit of humor during Cantine Aperte. Many participants will host a cartoon artist and visitors can watch comical drawings as they are created.